SCVHistory.com JD1901 | Newhall | Actor Tom Mix and 'Wonder Horse' Tony in Newhall, 1919. 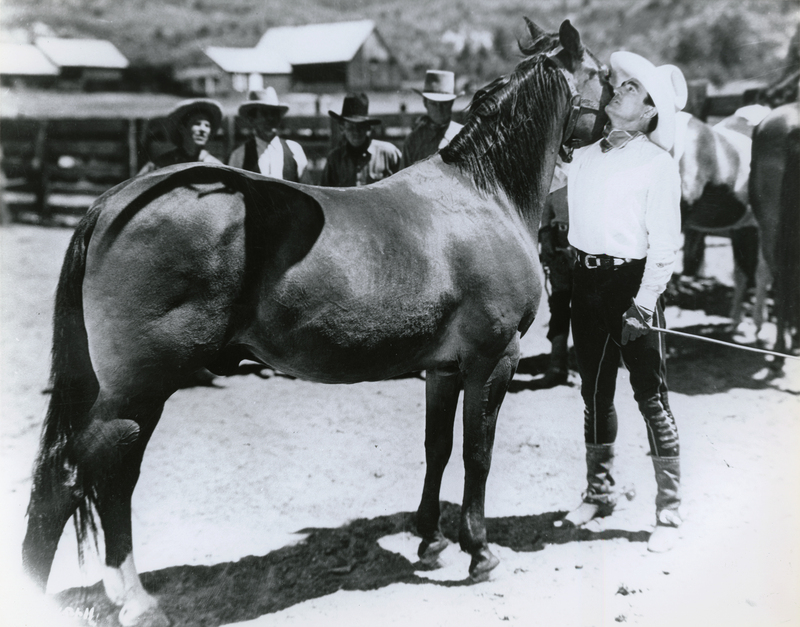 Tom Mix and his "Wonder Horse" Tony in Newhall, 1919. Picture taken in 1919 in the "Old Needham Grove" along Newhall Ave. west of the Santa Clarita Valley Chamber of Commerce building. This area was part of his old "Mixville Set" in old Newhall. The caption requires some explaining and begs some questions. At the time (early 1980s), the SCV Chamber of Commerce office building was located in the small "triangle" formed by Newhall Avenue, Walnut and Market streets — today's Veterans Historical Plaza. The Chamber office, previously the telephone company office, is better known today as the Pardee House. It was moved to Heritage Junction inside William S. Hart Park in 1992. Tom Mix used a larger triangular area in Newhall for studio operations in the late 1910s and 1920s — generally the area bounded by today's Main Street, Market Street and Newhall Avenue. So, it included but extended beyond the Veterans Historical Plaza triangle. The Chamber office was located at the northwestern corner of both triangles. We don't know the original source of Darcy's caption information, but if "west of" the Chamber office is accurate, that puts it west of Newhall Avenue, outside of the triangle(s). That is entirely possible. It seems to be consistent with the memory of lifelong resident Gladys Thibaudeau Laney (1910-2014), who in a televised interview said she remembered Mix purchasing Tony on her family's property when she was a child. The Thibaudeaus owned a great deal of property on the west side of Newhall Avenue. Laney also said Mix used her family's property for filming. We don't know exactly what is meant by "Old Needham Grove," although this is probably a picture of it. Henry Clay Needham was a major landowner in the 1880s and, coincidentally enough, had an interest in the Pardee House when it was in its original location on Pine Street in the early 1890s. JD1901: 9600 dpi jpeg from copy print from Jo Anne Darcy Collection, donated 2018 by her daughter, Joleen Darcy.